When it comes to traveling—for business or pleasure—almost all travelers bring luggage with them on their trips. However, many overlook the importance of properly packing your suitcase before your trip, which is easier than you might think. If you're getting ready for your upcoming trip, set aside a little extra time to pick out the clothing you want to bring, properly organize everything you're taking with you, and fold and store it all in your luggage neatly. Doing so will ensure that you don't end up with a wad of wrinkled clothes at your destination. Of course, you'll first need to pick out a carry-on bag and a convenient suitcase or piece of large luggage you want to pack it all in. Before you buy your luggage, though, make sure to check out the baggage allowances for whatever airline you're flying. That way, you can properly plan what you'll be able to bring with you on your travels. Countless travelers overpack for their vacations—oftentimes because they are afraid of being unprepared for certain weather, outings, or events—but extra luggage will weigh you down on your trip. To avoid overpacking, the first step is to organize what you want to take with you and eliminate items you don't need. You'll want to start by laying everything you expect to take on vacation where it's all visible at once, like on a bed. Then, you can use your knowledge of your destination—what you didn't wear last time you visited, what the weather forecast and guides say to pack, etcetera—to narrow down what you need to bring. Organize the items by order of importance. Start with the most important like clothing, toiletries, phone charger, a power converter for European outlets, and your important travel documents, then work your way down to "luxury" items like hand creams, books, and other small items that add up in weight and room. Consider what you'll need at your destination—and what it might already have there. You probably won't need to bring a towel to a resort, for instance, but you may want to pack a beach towel if you're going camping on the coast of Spain. Evaluate what your smartphone can replace in your luggage. While you'll need to have a GSM-compatible phone to make calls and send texts in Europe, your smartphone can save maps, act as a flashlight and camera, be used as an e-book reader, and even work as a translator via apps without the need for connectivity. You might consider replacing physical objects with apps for your trip. Look over all your option (in order of importance) and determine which point on the scale is the cut-off for "essential" items for your trip; leave everything you would consider "non-essential" out of your luggage for now. Once you've narrowed down your essentials, it's time to fold up your clothes to put them in your luggage—then, you can come back to see if you have room for non-essentials after. When it comes to saving space and getting to your destination with a wardrobe that's relatively wrinkle-free, the best way to fold your clothing is actually to roll it. You can take any t-shirt, sweater, or even pants, fold them in half, and roll them tightly from the bottom for safe storage. However, you might want to consider folding any jeans in half and placing them between layers instead. In any case, since the fabric isn't bunching up anywhere and you're creasing it less by rolling it, your clothing won't have as many wrinkles once you arrive. Once you've rolled all of you're clothing, it's time to pack your suitcase and carry-on bags. The first layer you'll put in will be made up of any heavy objects (like guidebooks) and all the clothing you've rolled. Next, you'll add in non-clothing items like toiletries, spare shoes, and a security pouch or money-belt, prescription medicines, an extra pair of glasses, contacted lenses, or a camera. After you've packed all of your essential items, you can return to your pile of non-essentials from organizing them before and see if there's anything you want to take to add a few creature comforts to your travels. However, you should remember to leave room to buy things at your destination if you hope to return with souvenirs and that you can almost always pick up things like toiletries and guidebooks once you arrive. 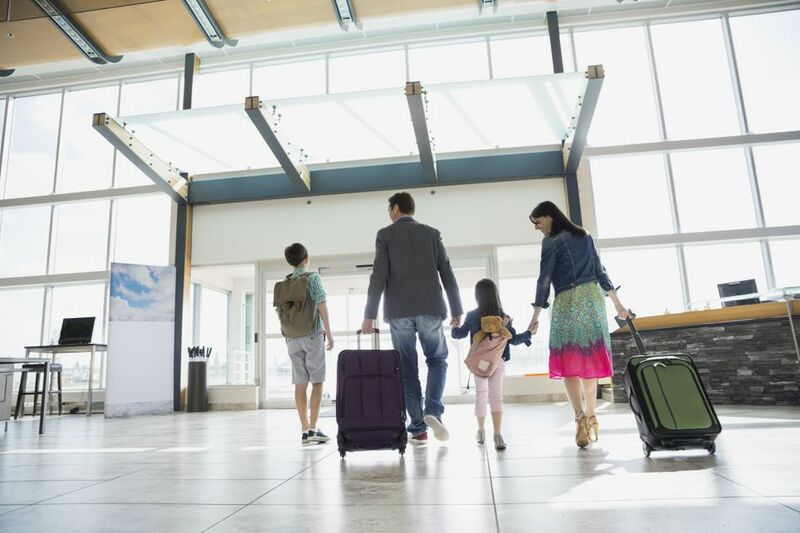 To make sure you're ready for departure, there are a few things you should do before you zip up your luggage and head out to the airport. Put everything that you won't need until you return from your travel in one place in your suitcase or carry-on. You should store things like your house keys, home currency, passport copies, and backup receipts somewhere you won't be accessing most of the trip, like a back pocket in a backpack or the bottom of a suitcase. You may also want to bring a plastic wallet (even the A4 plastic ring-binder files will do) and put everything you need at the airport in there. Because of numerous ID and ticket checks, you'll find yourself emptying pockets every few minutes and forgetting where you put things. However, if you start with empty pockets and everything you need in one place, you'll find everything much less stressful. If you are checking luggage, make sure that you have the following with you on the plane: anything valuable, anything that can break, medication, some basic toiletries, and clothing in case your bag is temporarily misplaced in transit. Should You Take a Duffel or Suitcase on Your Next Trip?